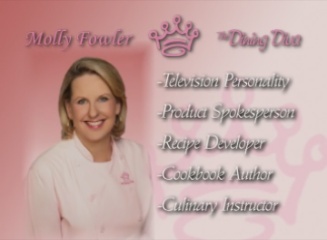 Molly Fowler, The Dining Diva, is a traveling culinary instructor, television personality, recipe developer, product spokesperson, and cookbook author who demonstrates entertaining with ease, flair and impact. Her credo, “Make every day an occasion”, reflects her attitude and approach to cooking. Author of Menus for Entertaining, Molly hosted her own 30-minute television cooking show, All the Right Ingredients, airing on Houston’s KHOU/CBS Channel 11 for three years. Molly has been the spokesperson for the Texas Vegetable Growers Association and for the Texas Department of Agriculture; she is a frequent speaker and presenter at various civic venues such as The Woodlands Home & Garden Show, Fredericksburg Food and Wine Fest, Grand Wine and Food Affair (Fort Bend County), the Texas State Fair, and at international food conferences. She also hosts culinary tours and cruises throughout Europe and to local Texas venues. Her culinary career began in 1989 when she founded a catering company in Denver. She now resides in Houston where she has an extensive fan base because of her appearances on ABC LiveWell Network’s program, Deals, Houston’s KHOU/CBS Channel 11 Great Day Houston, and Victoria’s KAVU/ABC Channel 25 Sunrise. She has appeared on Texas Country Reporter (shown statewide, and nationally on RFD-TV via cable and satellite providers), on KPRC/NBC Channel 2 in Houston, on ABC and Fox affiliates in Dallas, Austin, and San Antonio, and on radio stations across Texas. Molly is an oft-requested instructor for Texas’ HEB Central Market Cooking Schools, Cunningham Gas Products in Houston, The Cooking Depot in Cuero, Lake Austin Spa & Resort, The Arbor Gate in Tomball, Market Street in Colleyville & McKinney, at Sub-Zero/Wolf appliance showrooms, and at other private and public venues across the state. Molly’s skill, humor, and food artistry come together in presentations that provide a delicious serving of information and entertainment.